Hey everybody! We are back from our Disney adventure to our dismay- we were hoping we could just continue traveling the world...but here we are back at work. Before we get into the Disney trip recaps I need to review a mini trip we did the weekend before we left. Tim and I joined Brittni, Stephen and Emma for a trip to Mystic Aquarium. They invited us to come with them for Saturday afternoon and lucky for us they have a membership so we were able to join for free! 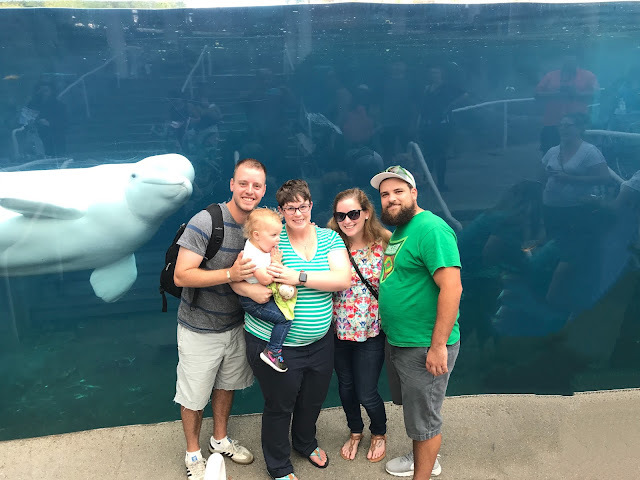 Tim and I enjoy the aquarium just as much as your average kid if not more so we were excited to visit our aquatic friends! 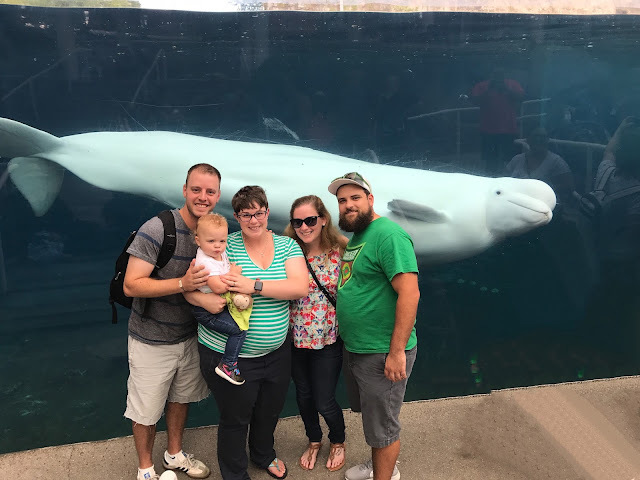 Mystic Aquarium has an amazing beluga whale exhibit and they are so interactive always coming right up to the glass. 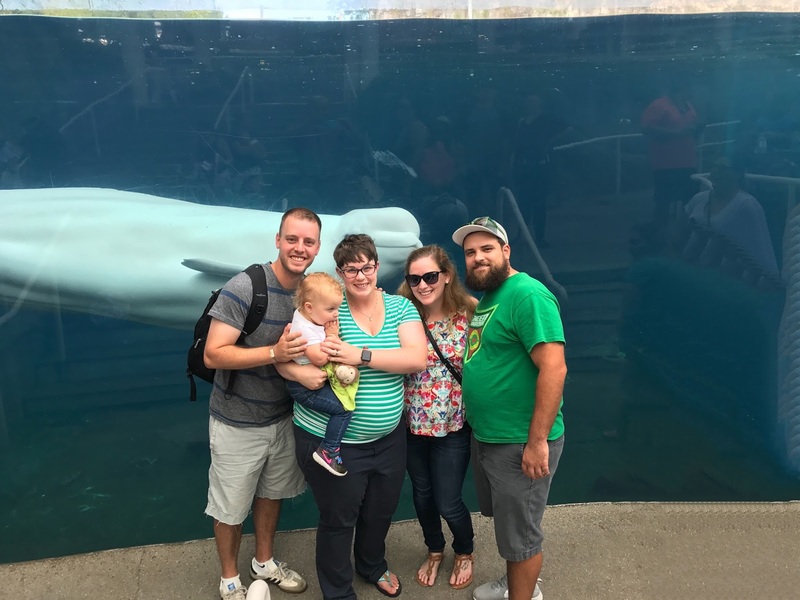 We were able to get some great pictures with one of the whales right behind us! I love that in this picture it looks like Emma is the one taking the selfie. I see a lot of picture taking in this kids future- I mean she's learning from the best! Another favorite outdoor exhibit is the penguins! This aquarium has a huge collection of penguins and they are hilarious to watch. We stood outside for a bit to watch them get fed and then decided to head inside to check out the other exhibits. Emma thought the penguins were pretty funny as well. On our way inside we stopped to point out some frogs to Emma. She was really enjoying herself! Emma really liked watching all of the fish inside the aquarium as well and we enjoyed pointing out Nemo and Dory to her. Now one of her favorite things to do is hold on to two adults hands and drop her weight entirely. Nothing is more fun then having adults carry your weight right?! There was also a shark tank which had a couple of sleeping sharks- not too exciting! There were too many Nemos to count in this tank! Turtles are one of my favorite sea creatures- I just think they are so cute! I thought it would be nice to take a cute family picture for them- Emma was a little distracted by the tank behind me. Her "cheese" face is hilarious though! We wandered through the exhibits indoors for a bit before heading back outside. We walked around through the courtyard to the next building where Emma had a grand old time playing inside a jeep. There were a ton of kids super excited about this jeep. It's one of those things that every kid wanted to climb in while the adults stood there wondering why it was such an exciting thing... crazy kids! I thought this picture was super cute! Just going for a bobsled ride. After finishing at the frog exhibit we headed to our final stop at the sea lion show. While we waited for the show to start Emma climbed around and kept pulling Tim's hat of his head and laughing. I didn't take any pictures at the sea lion show but it was super cute and different from the last time we saw it. After we finished at the show we could tell Emma was definitely ready for a nap. She passed right out in the car! It was a fun afternoon and we are super grateful to Brittni and Stephen for taking us along!